The 2018 Festival takes place between Saturday 24th February and Sunday 11th March 2018, with the main event at the Town Hall on Thursday 8th March 2018. The theme for the 2018 Festival celebrates the centenary of the first British women getting the vote, following the Representation of the People Act in 1918. The festival theme is ‘Winning the Vote’. In conjunction with Oxford International Women’s Festival , Oxford Community-led Housing research project and Transition by Design is organising a session on “Taking Control of our Housing: Women Leading the Charge”, to celebrate the efforts of a number of women pioneering community-led housing in various forms in Oxfordshire. In line with the festival’s broader theme of “Winning the Vote: Women’s Suffrage 100 Years On”, the session aims to raise awareness around community-led housing and an opportunity to gain fresh interest and broaden the movement. Join us in the much-needed discussion to highlight that affordable, self and secure housing is a basic human right. The session will champion the idea that women can and are taking action to tackle the housing crisis in Oxford, and to generate discussion that homes and housing shape our identity as women and as human beings. We’re also very keen to find out more about the challenges you’re facing with the housing market. And to top it up, let’s celebrate the efforts of women in community-led housing. Venue: Meet inside Oxford Town Hall, St Aldates. Wheelchair access in the Town Hall but not on the walk / All welcome. Cost of admission £8 and £4 concessions. All money will go to the Festival. This popular walk retraces some of the history of the women suffrage activists in Oxford. It is a gentle guided walk by women’s historian, Dr Katherine Bradley, author of the illustrated booklet, ‘Women on the March’. Venue: Risinghurst Community Centre, Kiln Lane, Risinghurst, OX3 8ER. Wheelchair access/Women only. Minimal donation £5 to cover costs. Refreshments provided. The ‘change’, ‘the time of life’ – call it what you will, the fact is that all women go through the menopause. Yet, it is often still a subject of embarrassment and myths. Join other women to learn and share experiences of what the menopause means for women today and what, if anything has changed over the last 100 years. Facilitators Jayne Wright & Bev Gurney. Venue: Meet inside Oxford Town Hall, St Aldates. Wheelchair access in the Town Hall but not on the walk /All welcome. Cost of admission £8 and £4 concessions. All money will go to the Festival. This popular walk retraces some of the history of the women suffrage activists in Oxford. It is a gentle guided walk by women’s historian, Dr Katherine Bradley, author of the illustrated booklet, ‘Women on the March’. Meeting House, 43 St Giles, OX1 3LW. war and suffrage. Freedom From Torture, Oxfordshire Members Group. Venue: The Lounge, East Oxford Community Centre, Princes Street, OX4 1DD. Wheelchair access /All welcome / Light refreshments provided. Free entry. Celebrating Sylvia Pankhurst’s life and work. Votes for women and world peace campaigner. Advocate for workers rights, equal rights and better healthcare for women, nursery education and widow’s pensions. Anti-fascist, anti-racist champion for Ethiopian independence from colonial rule. Speakers: Professor Mary Davis, Visiting Professor of Labour History at Royal Holloway University of London. Meirian Jump, Archivist & Library Manager, Marx Memorial Library. Sponsored by: ODTUC, African Caribbean Kultural Heritage Initiative, Faringdon Peace Group, Network of Oxford Women, Oxfordshire CPB. Venue: East Oxford Community Centre, 44 Princes Street, OX4 1DD. Wheelchair access/All welcome/Admission free but contributions to OIWF welcome. Short film and discussion about Princess Sophia Alexandra Duleep Singh, a prominent UK suffragette. Her father was Maharaja Duleep Singh, who abdicated his kingdom of Punjab to the British Raj and was exiled to England. Sophia’s Godmother was Queen Victoria. Booking optional by email or phone Debbie Hollingsworth 07812350892 | wedgedaisy@gmail.com | Unison Oxfordshire County Branch and Oxfordshire Unison Health Branch. Venue: Christ Church College, The Undercroft Bar, St Aldates, OX1 1DP. Wheelchair access /All welcome / Free – donations welcome. Light refreshments. An evening exploring gender, fair trade and the ‘tipping point’ – what influences women to take action and have a lasting impact in the fair trade movement. Three women share stories, explore significant challenges and celebrate the successes. Visit eventbrite for info on speakers. Venue: John Henry Brookes Main Lecture Theatre, John Henry Brookes Building, Headington Campus, Gipsy Lane, Oxford OX3 0BP. Free / Wheelchair access / All welcome.Tea Colaianni, Non-Executive Director of Mothercare, will discuss the most pressing issues facing women in business with Oxford Brookes Professor Simonetta Manfredi. Join us in our celebration of International Women’s Day! The theme, ‘Winning the Vote: Women’s Suffrage One Hundred Years’ on will be explored through music, discussion and debate. Oxford had large women’s suffrage and anti-suffrage organisations. They held many meetings in Oxford Town Hall. The first part of the evening will be an imagined debate between leading local and national speakers from both sides. This takes place in 1912, just after the failed arson attempt by two suffragettes and the subsequent court case in Oxford Crown Court and the failure of another women’s suffrage bill in Parliament. Come, meet and hear the participants: Millicent Fawcett – President and Founder of the National Union of the Women’s Suffrage Societies (suffragist); Mrs Winifred Haverfield – Secretary of the Oxford Women’s Suffrage Society (suffragist); Annie Kenney – Organiser for the Women’s Social and Political Union (suffragette); Professor Albert Dicey – Vinerian Professor of Law, author of ‘Letters to a Friend on Votes for Women’ (anti-suffragist); Countess of Jersey – President of the National League Opposing Women’s Suffrage; Mrs Humphry Ward – Founder of the Women’s Anti-Suffrage League and editor of ‘The Anti-Suffrage Review’. The debate will be chaired by Baroness Helena Kennedy, QC. Suffrage music will be provided by the Windrush Quartet. The second part of the evening will be a discussion and reflection of what the vote means to women in the 21st century. This will be led by Diane Atkinson (historian and author of ‘The Remarkable Lives of the Suffragettes’); Helen Ghosh (Director-General, National Trust and future Master, Balliol College, Oxford); Kerry-Anne Mendoza (political journalist, writer and author of ‘Austerity: the Demolition of the Welfare State and the Rise of the Zombie’); a member of the Women’s Equality Party and chaired by Anneliese Dodds (MP, Oxford East and Treasury Shadow Minister). How to book! Contact: oxfordwomen@gmail.com or just drop in. Please note the change of venue. A Day of Wellbeing Activities for Women is now at Ark-T, 10-5.30pm,with food provided by Camerados. Wheelchair access/Women only, including all who identify as women. All therapies, workshops and food free, but donations gratefully accepted. A space for women to celebrate IWD with classes from Big Beats Dance, Pure Relaxation Yoga and Om & Bass Yoga. Local therapists giving massage, reiki and treatments. Wellbeing workshops and BuddhaBing café. Venue: The Jam Factory, Hollybush Row, OX1 1HU. Wheelchair friendly/Baby changing facilities/Disabled facilities/All welcome/Admission free. HATCHED 2018 will run from 8th March–23rd April and will showcase Oxfordshire-based artists’ work addressing private and public female experiences. It aims to start conversations and make a difference to current social, political and cultural concerns. Venue: International Gender Studies Centre, Lady Margaret Hall, Norham Gardens, OX2 6QA. Some stairs at venue /All welcome / Free. A roundtable of feminists reflects on a diversity of feminist standpoints, ideological perspectives and life-experiences, exploring together with the audience problematical but enduring assumptions about the intrinsic link between women’s votes, women’s empowerment, shared aspirations and commonality of choice. 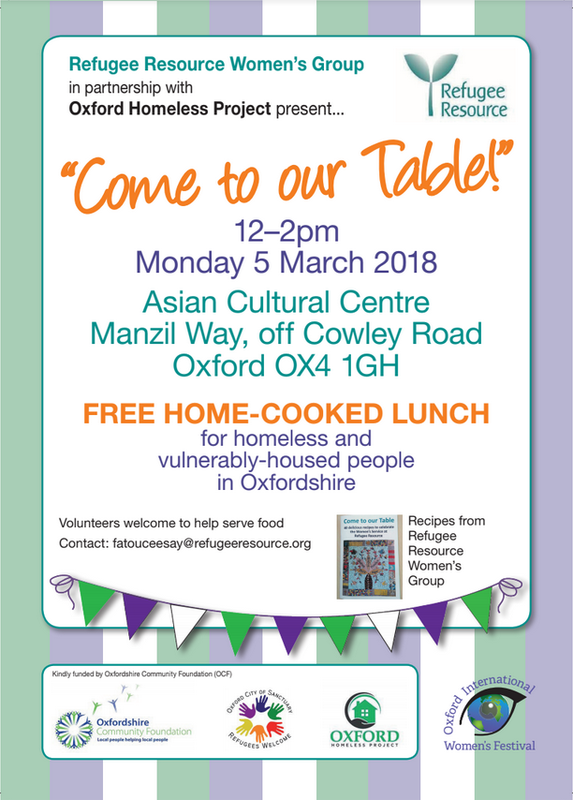 Venue: Asian Cultural Centre, Cowley, OX4. Admission £1 per adult, children free. Money raised from entry will go to a local women’s charity (to be decided). A family-friendly event, in demonstration of and celebrating diversity. Audience from a wide range of ethnic and cultural backgrounds as guest speakers talking about their perspective on the suffrage, where we were, where we are now and what more needs to be done. All in a backdrop of stalls, food and entertainment, aiming at bringing communities together. Running for the second year. Not to be missed! Opening by Lord Mayor (TBC)! In this experiential workshop we will journey with a drum beat to meet an aspect of the Divine Feminine, then explore this through creative expression, to bring more beauty and blessing into your life and more balance to the world. Led by Jackie Singer. Venue: East Oxford Community Centre, 44 Princes Street, OX4 1DD. Wheelchair access / All welcome / Admission free but contributions to OIWF welcome. Come and join us to celebrate women’s suffrage across the world. Enjoy a fantastic evening of live music and spoken word hosted by Oxford Love Music Hate Racism. Booking recommended by Saturday 10 March.